Phlox paniculata is one of my very favourite herbaceous perennials. Perhaps out of fashion it gets little acclaim and some think it common. Choose you variety and you have almost all the colours of the rainbow. You can have the Union Jack, happily still flying in red, white and blue. Flower colours are strong and vibrant and I can think of no plant with more intense exuberant white flowers. 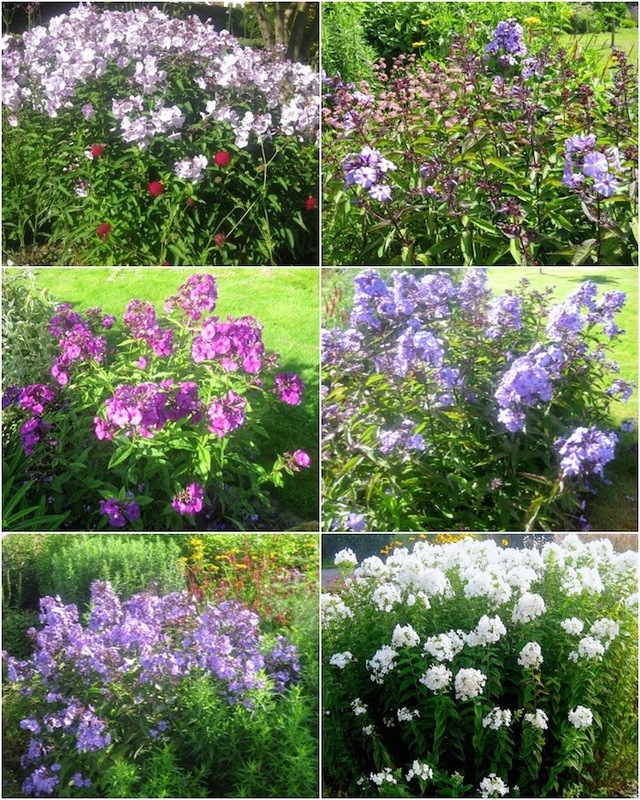 Just google ‘phlox images’ to see the huge range of strong colours. Often scented, sometimes magnificently so, a fine feature of phlox is that the flowers last for three months! Some perennial plants have the achilles heal that although magnificent in pictures they only last a few days. Not phlox. If you choose your range of cultivars carefully you can have them in flower from May to October. Phlox like a water retentive soil and readily available water, right through the Summer. Although they do not like water-logged soil, parts of my garden are not very far from it. Some readers may recall that the bottom of my garden sometimes floods for short periods and I have created raised beds above the water and have eccentrically buried great wads of water retentive newspaper. I think my Phlox ‘Laura’ does its very best planted there. Phlox ‘Laura’ is planted over more than a foot of newspaper! In relation to Summer water supply, my zero cultivation has special value as roots love to come right up to the surface where they can benefit from light showers. Mulching helps and has multiple benefits but is sometimes over-rated where a blanket of absorptive material intercepts light rain. The latter comment does not apply to a gravel mulch and I have a large clump of phlox in a gravel mulched and otherwise dry part of my garden. In this latter case the strength of transpiration is reduced after about one o’clock when the sun moves to the back of my house and my plant is in partial shade. Phlox does not like the dehydrating conditions near hedges and under trees. Although in Bolton Percy cemetery I have had a fine clump of several square meters for about 25 years it is now starting to severely decline as adjacent trees have got bigger and take increasing amounts of water and light. Now declined from former magnificence this plant has been in place in Bolton Percy cemetery for thirty years. Needless to say if your borders are very weedy and plants are crowded together there will be increased competition for water. I do not irrigate any of my own phlox but of course in Summer drought it is generally worthwhile to heavily water a plant with several gallons. Water infrequently and never water established perennial plants ‘little and often’ - unless you grow them in a tub! Phlox grows well in full sunshine provided it has freely available moisture. If not, it is best if they receive some shade for part of the day. It seems to be agreed that they are best if exposed to direct sunshine that adds up to at least four hours on a sunny day. Less light and they will grow with poor vigour and be susceptible to mildew. A few of mine fail this test even though the shade is not heavy. Sorry about the pun but I could not resist it as so many none gardeners confuse stocks and phlox! Phlox are very easily propagated by simple division. With a sharp spade, just chop and replant, perhaps a little deeper than before. From early September right through until early May will be fine to propagate and/or move them. It would be silly to divide in full Summer but if you are desperate and moving house just cut back the top and move them! Plants from the garden centre unless soft from a tunnel can be planted anytime but if you do so in Summer remember to water. Division. A sharp chop from a spade might break your wrist. Perhaps better to undercut gently. Although division will be easier if you lift the whole plant, unless you are a nurseryman or moving house I do not recommend it. Like many herbaceous perennials your plants will improve from year to year if you leave them alone. The second year plants will be much stronger than the first year when plants are establishing. We were very disappointed when we moved to our sandy soil - sandy soils are notorious for lacking nutrients - that our phlox were very slow to get going. It was year three before we were proud of them. 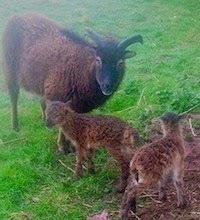 I now wish I had given them some of my Yaramila NPK fertiliser. I read that in some cases phlox need to be in place for up to five years before they achieve their full grandeur. I am inclined to agree, especially with variegated varieties. Well established clumps will have greater stored food reserves and I suspect a stronger root system to go down deep and fine water. I am not one to believe strictures to replant herbaceous borders every three to five years. Gardeners who need to do so must have made a very bad fist of it first time round! I do not buy into the myth that large clumps of phlox become hollow and diseased in the middle. In the old days every article one read about phlox emphasised you could propagate them by root cuttings to eliminate stem eelworm. Forget all that nonsense - albeit the fact is a true one. I have never suffered this pest in fifty years and if I did I would burn my plants. Although phlox has its fair share of pest and diseases, my own have only a few minor blemishes and I never spray them. 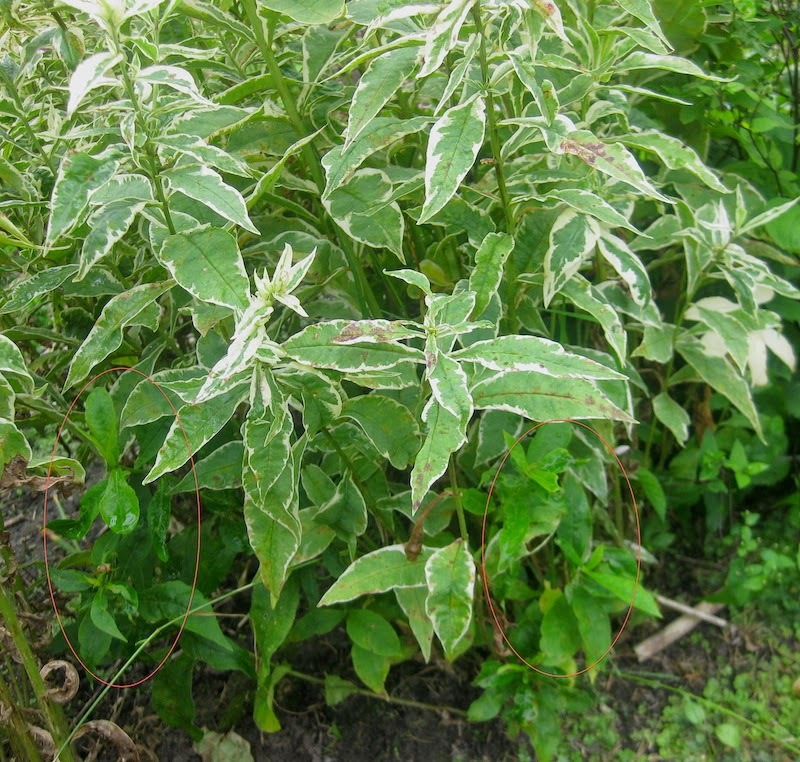 Mildew is the most reported disease and some varieties are promoted as resistant. Not only are there differences in varietal susceptibility there would seem to be fungus strains of varying virulence. Carried by air borne spores, powdery mildews are quite host-specific and by way of example rose, apple and phlox mildews are all different. According to the UK gardening press it has been the year of the mildews. The disease has been rather over-hyped, and I looked around my garden to find some and failed. My friend Iris remarked she had suffered from mildew badly this year. Was it that her garden is heavily shaded and her plants rather crowded, or was it that having seen it on the tele she noticed it for the first time? I suspect I am myself similarly blind when plants such as pulmonarias show mildew when they die down. It is just part of the natural cycle. Mildews are a classic example of the principle that when plants are well grown they are less likely to suffer from pest and disease. Predisposing factors are too little direct sunshine and lack of moisture. Although phlox will grow well under trees the shade must not be heavy. Does phlox paniculata need staking? In my view no. But then I do go rather over the top on this issue. I think for many gardeners a crutch is more of a mental one for themselves rather than a support for their plants. When in a gale their plants are severely damaged some gardeners comfort themselves that they did their best as they set about undoing the damage and re-staking, whereas I just stroll round my borders, observe that a few stalks are broken or out of place and cut them away. I fully understand that in some gardens the beds are too narrow or the plants are feeble and perhaps crowded; plants might be drawn because they are at the back of a border, have not grown sturdily in an open position or are subject to swirling winds between buildings and do need staking. And perhaps if you face Atlantic winds on the Isle of Mann you will be lucky to grow any tall herbaceous perennials at all. Even in my own garden Brenda insists on staking delphiniums and putting a string around a few of the taller herbaceous plants. If you do feel your phlox might need support you might be better growing the more compact varieties although my own tall ones such as wonderful white Phlox 'Mount Fuji' stand sturdy like soldiers. Another strategy is to give your phlox the ‘Chelsea chop’ to ensure compactness - I can barely bring myself to be so PC and use that phrase. There are many other wonderful phlox and I have grown a few of them. Often with limited success and sometimes total failure. Many can be described as a ‘good nurseryman’s plant '. They look wonderful, die on you and you buy another! This is not true of them all and in my own garden Phlox subulata thrives. Phlox subulata makes excellent ground cover. Here I have plunged winter-tender pittosporum. The few yellow patches are where I have sprayed out weed. If anything would seem to be a fundamental part of horticulture, it is crop rotation. It is therefore with some hesitation that I challenge the value of the traditional three and four year formal rotation. If you read the popular gardening press it appears to be mandatory for anyone who wishes to grow vegetables. Whenever I pick up a beginners gardening book there are complicated diagrams of how to precisely manage your plot! I wonder how many allotment growers actually formally rotate. Personally I have always paid lip service to the notion of not following one crop with another of the same kind and more specifically not growing in succession plants from the same family. For example if I wanted to grow turnips, they would not immediately precede or follow cabbages. Actually if I was to be really truthful I don’t like turnips and delicious swedes (which we call turnips in the north) are best grown by a farmer! As the years pass I find myself less and less a slave to the idea of rotation. I grow numerous brassicas and although I vaguely try not to follow one with another, I frequently fail. 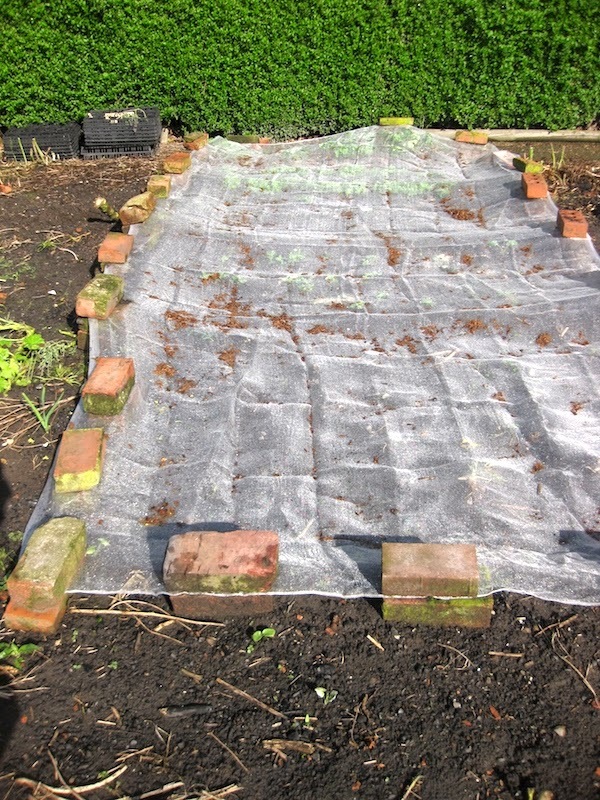 I practice a lot of inter-cropping and frequently one crop immediately follows another and for example I might even sow my broad beans under the canopy of not yet completely consumed sprouts (a rather unorthodox practice). I frequently plant in double rows or blocks and my layouts are more designed to efficiently use my enviro-mesh to keep off the pigeons, discourage the mice or keep the carrot fly away. If my only choice of planting site is near my wretched cherry tree when it is really dry in summer or planting one brassica after another the latter choice wins! I had a wonderful early crop of broad beans, but now soil under the cherry tree is severely dehydrated! Rotation is a respected agricultural tradition. We all remember ‘Turnip’ Townsend’s four course rotation from our history lesson at school. It was a major leap forward in farming three hundred years ago.The four year rotation continued to be used for a very long time. No longer relevant in modern agriculture, much longer rotations that last many years still have a place and farmers who insist on mono-cropping have their own special problems. The four course rotation was an important innovation as intensive agriculture started to develop. Before that land was often left fallow from one crop to another. It was long before fertilisers had been invented. I imagine it likely that although artisans appreciated the value of animal manures on their own plots they were not initially much used in the new technology of farming. What an advance when nitrogen fixing clover was introduced and both turnips and clover brought browsing cattle and perhaps rootling pigs onto the land to add droppings and urine. Clover, peas and beans in a rotation all facilitated bacteria to fix atmospheric nitrogen and enabled this most valuable of nutrients to enter the ground in an available form. Weed control was primitive and barely existed. Some crops such as peas were considered ‘dirty’ and allow prolific growth of weeds, other crops like potatoes could be used as cleaning crops because of their strong weed smothering growth. A rotation of crops probably helped to efficiently recycle organic debris and nutrients. Different crops have different nutrient requirements and might make varying nutritional demands of the land. In those days there was great merit in following nitrogen fixing legumes with nitrogen hungry brassicas. It makes a huge difference to the yield of brassicas to have an ample supply of nitrogen. 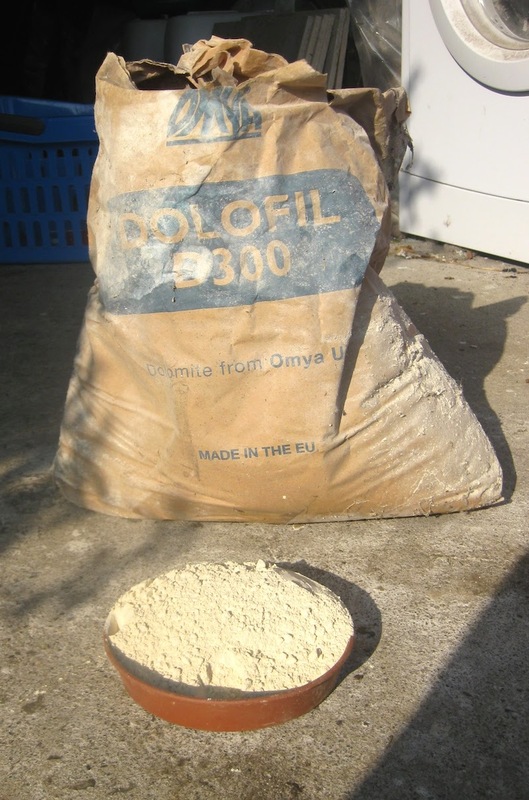 Some soils over the years can become acid and adding lime can sometimes increase yield. It was sensible in olden times that where lime was needed, it was best to apply it immediately before brassicas. Soil alkalinity reduces the severity of clubroot, a severe scourge of these plants. If there was (and still is) a single major advantage of rotation it is reducing the infection and build up of soil borne pest and disease. So why is a formal rotation irrelevant now? A very significant disadvantage is that it commits the gardener to growing more of a particular crop than he needs. Worse it encourages an annual cycle with what many of we minimum cultivators regard as the decadent practice of leaving an empty, fallow, dug-over plot to be leached, denuded and eroded by wind and rain throughout the Winter. Best for both the kitchen needs and soil fertility to grow vegetables in every season. Vegetables such as overwintered leeks, sprouting broccoli and sprouts will be in the wrong place when a new cycle of rotation commences. On a similar theme, most modern vegetable growers grow more than one crop in a year. Many fashionable vegetable crops such a ‘salad leaves’ need to be resown several times over to achieve continuity. Many gardeners these days wish to explore the possibilities of inter-cropping, companion planting and green manuring. It’s very inconvenient and technically limiting to insist on growing similar plants together. Some traditional reasons for rotation are just out of date! Good gardeners whatever their precise methods maintain good weed control all the year round. Many of us try to practice zero tolerance of weeds setting seed. None diggers refuse to bring ancient buried weed seed to the surface! My own peas and beans are just as clean as my potatoes! As a user of glyphosate I have no perennial weed to smother! The balanced take-up of nutrients where various crops have different requirements now fails to impress. Organic gardeners, especially the none digging kind, maintain high level of soil organic matter which provides an excellent store of nitrogen and all necessary plant nutrients. Growers like myself do the same and are also prepared to supplement plant nutrient requirements with fertilisers. In whatever order we grow our plants they will not go short of nutrients and leaching of nutrients will be no less or greater than if we were to formally rotate. The cycle in a rotation defined as ‘roots’ is fundamentally flawed and still supports the ‘baby-talk’ that roots require extra phosphate. There are so many different families of plants that develop fleshy roots (or swollen stem bases such as kohl rabi and some fennels). Carrots, swedes, parsnips, beetroot all belong to very different families with distinct nutrient requirements. Turnips and swedes are also brassicas and are both susceptible to clubroot. Does it count as a root or can you grow fennel anywhere? er, not in the lawn! In fact many of the constituents of the formal vegetable groupings are rather a rag bag of disparate types. Even the RHS on its website admits that for many of the extended range of vegetables we grow these days it does not really matter about rotating. Plants such as sweet corn, cucurbits, french beans, runner beans, salads (a huge group) and peppers can by common consent be grown anywhere. When I think about that list it includes almost all of the vegetables I grow! 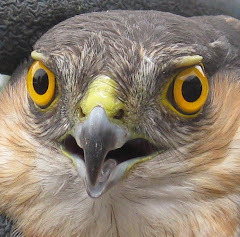 My biggest objection to formal rotations is that they often fail in their main purpose of reducing pest and disease. In very small gardens the different sections are just too close together to properly isolate them. Rotations are too short to prevent clubroot which can survive in the soil for as much as twenty years. I know many gardens where clubroot has efficiently been dispersed across the whole plot on soil attached to plant roots - not necessarily brassicas - as they have been rotated around. At least the crops are isolated here! The only way this fungus disease will infect your crop is from soil. On dirty spades, boots and principally plants. There is no other way it will enter your system. Sad to say many gardeners inherit a vegetable garden completely contaminated and unless their name is Methuselah they will never see the end of it! It used to be such common practice to buy a few brassica plants at the market and - bingo, you had introduced this disease. If you are lucky enough to be club root free, always propagate your own plants and do so in uncontaminated compost. In the past I have had some near misses when so called friends have insisted they give me a wonderful new brassica variety. After they have gone they go on the fire!. They must find me extremely incompetent when on their next visit their plants are not to be seen! My allotment in Bolton Percy was clubroot free for the twenty years I cropped it. I cannot say the same of the adjacent plot that I took over from another gardener. Fortunately he did not have the plot very long and he had not had time to rotate clubroot around!. I knew the exact location of the infected soil and never grew brassicas there. It might have helped that I don’t dig and don’t do any cultivations that involve shifting soil. I have no idea whether there was any degree of spread from my numerous worms! I supposed it helped that the plot was long and thin! The fact that I did not have a compost heap and weeds were left to die in situ was not insignificant. If you move contaminated compost around you might very well spread this debilitating disease. Can soil on a trowel spread clubroot around? The good news is that you can get a very good brassica crop on infected soil if you use lime and raise the soil pH to 7.5. It’s not that brassicas really like to be so alkaline it’s just that club root hates it! This involves doing the complete opposite of rotation as pH 7.5 will be far too high for any crop that follows. By mono-cropping you might still enjoy all those lovely Winter greens! I have run out of time! I wanted to explore each of the following. Little and Large of tomatoes Albenga (Mole seeds) and Sweet Million (Marshalls). 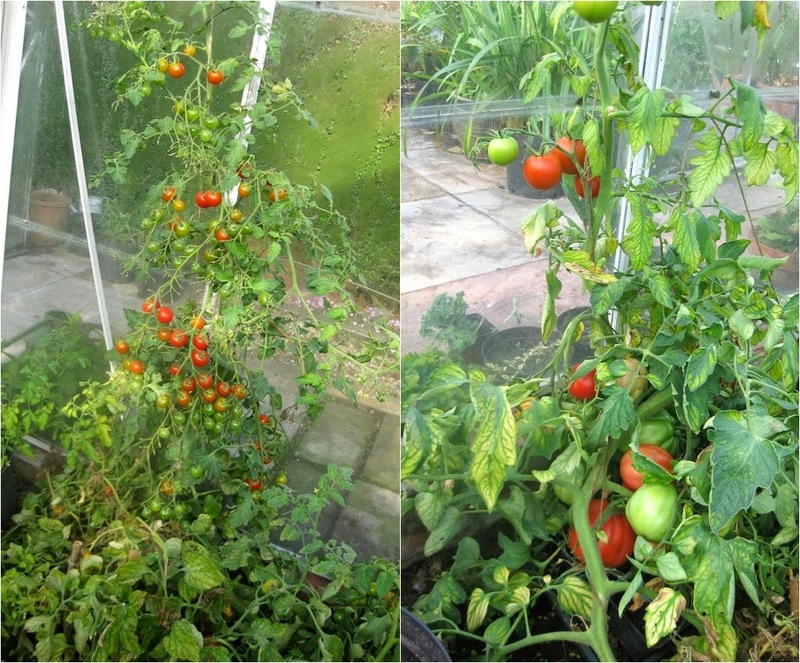 Both are more pest and disease resistant than similar Marmande and Gardener’s Delight. Too much of a challenge for even these fine varieties as the soil has not been changed for five years! 2.My peppers now looking good resown and planted in the same soil for four years now. 3.Considerations when replanting perennial crops such as raspberries, strawberries and blackcurrants. 5.Whether there is a need for rotation in the ornamental garden. 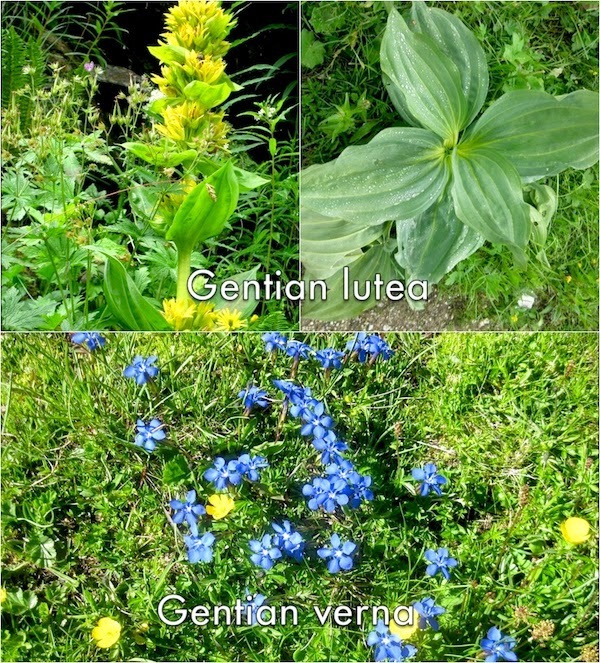 6.How some different plants do specially well and others particularly badly, when one follows another. 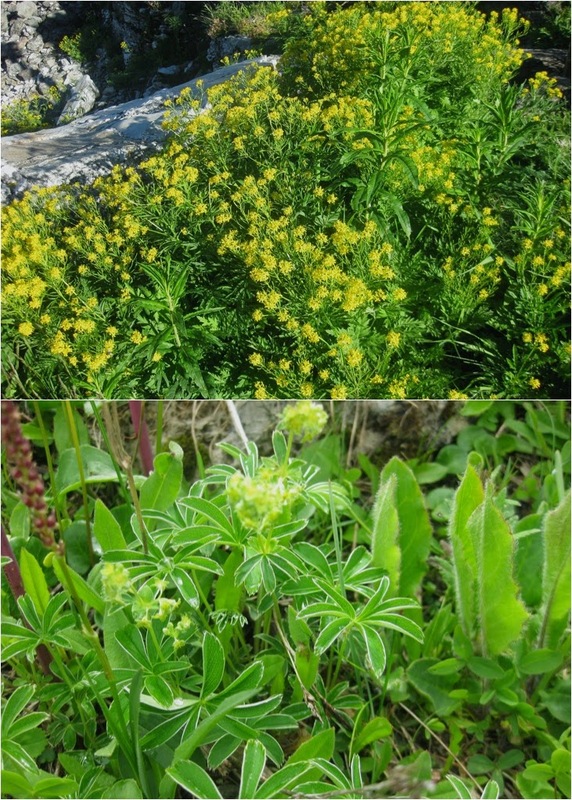 7.Whether garden and natural ecological successions are inhibited or promoted by pest and disease. 8.Gardens I know where it is now impossible to grow delphiniums and trilliums because of soil contamination. 9.Not to mention brother-in-law Dave who has white rot contaminated soil and has had to stop growing onions. If you have alighted on this page hoping to find precise botanical identifications of alpine plants you might be disappointed. 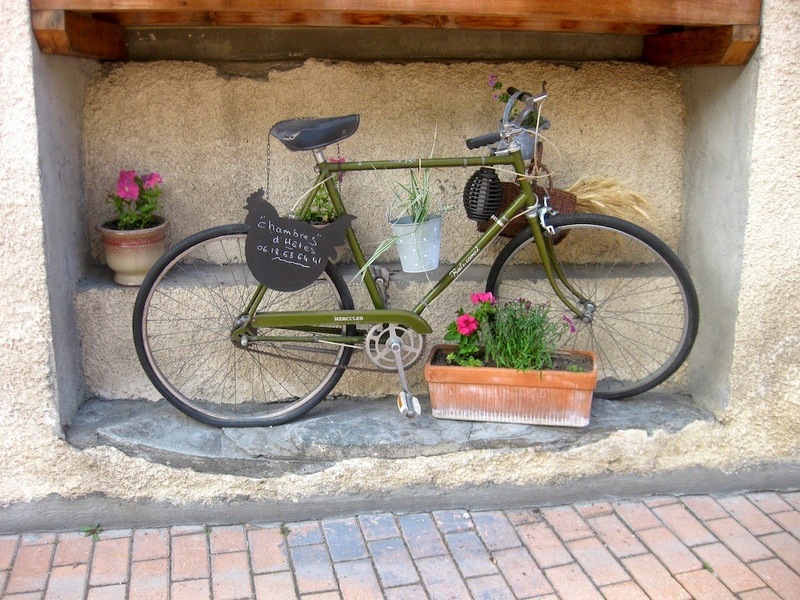 If you would like to hear a gardener’s reminiscences, pictures and interpretations of wonderful French alpen flowers you might wish to stay. 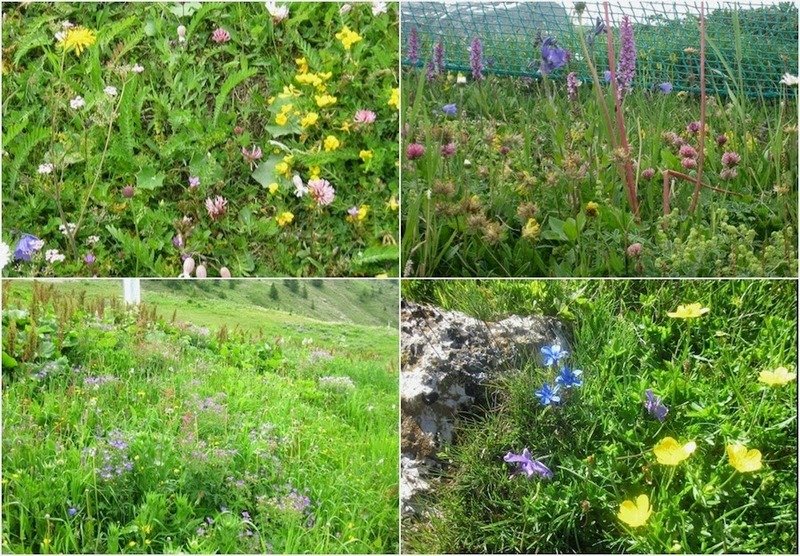 Personally, lacking precise knowledge of alpine plants, it is a revelation, how many wild flowers one actually recognises as delicate versions of one’s own garden plants, and later, with the help of the computer, the thrill of finding their actual botanical names. Regular readers will wonder how Brenda has yet again dragged me away from my garden. This time up 2500 meters to a skiing resort in July! The silver spooned old lady on the London bus (free to UK pensioners) who engaged Brenda in conversation, had it right when she declared that the flowers would be absolutely stunning. Tignes is one of the very best skiing resorts in Europe and has re-invented itself as a place to go to throughout the year. Summer sports of every description are there, be it fully organised tournaments and matches, individual tennis, badminton, table tennis or cycling. As an adult or a child you can turn up at almost any of the magnificent indoor or outdoor sports facilities and get a game of soccer or basketball at the drop of a hat. It is heaven for the fit sporty people who take their holidays there. 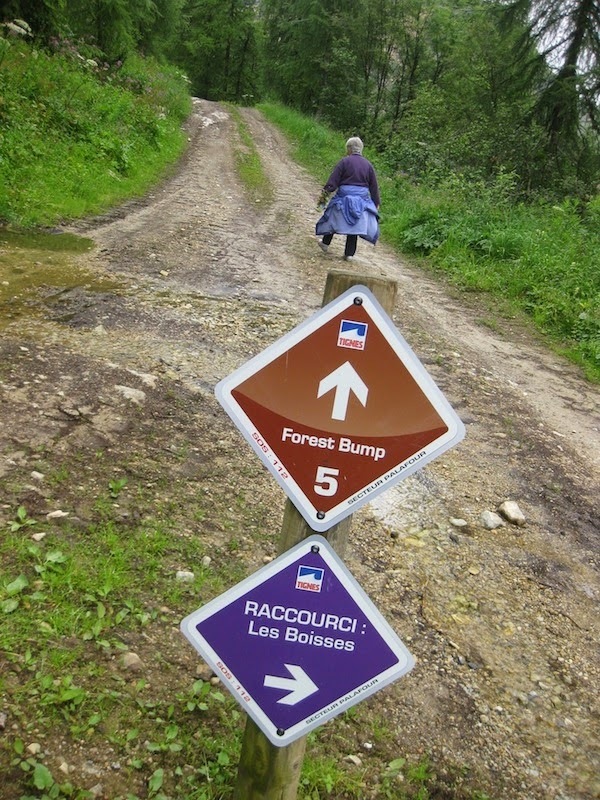 The ski lifts are open to elevate the thousands of mountain-bikers who speed down the numerous safe, but to our eyes, rather treacherous tracks. You can ascend in the large ski cabins, usually without charge, to just admire the views or walk in the mountains. There are hundreds of well signposted, even-surfaced paths to enjoy the second-to-none scenery and absolutely astounding carpets of flowers. You are overtaken by muscled, determined, speedy walkers and while we are repeatedly down on our knees examining the flowers they do not have the eyes to see them. 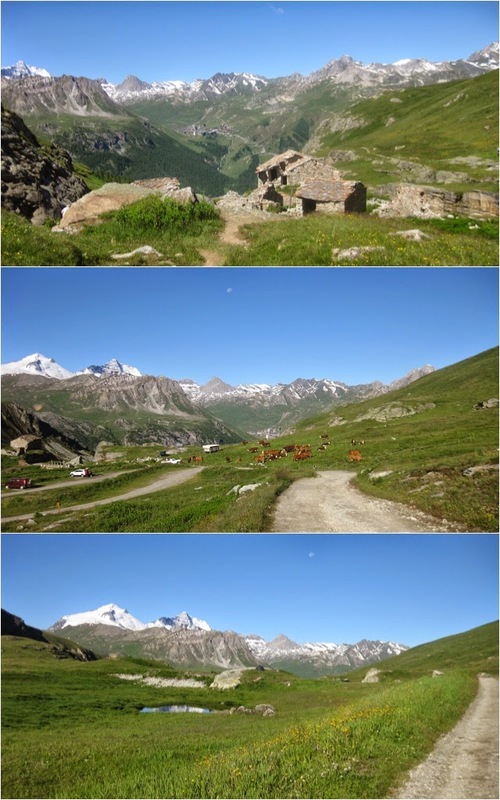 In July before the full Summer school holidays but after the skiing, is one of the down-seasons. Everything is still open but it isn’t crowded. It is really the very best time for the Spring flowers. Yes, Spring flowers in July! We are there to meet up with Brenda’s family. The parents could only stay for the weekend and we were to take charge of Rufus and Felix (or more precisely they organised us) until Thursday before being relieved by sporty Uncle Iain who arrived for glacier skiing and serious mountain walking. For the few days when we were allegedly in charge we could take the half hourly complimentary navette 200 meters up the mountain to the main Tignes town. To a very limited degree we joined in with badminton, tennis and table tennis but opted out of the football and optic shooting. It’s very frustrating for Brenda who has played badminton and tennis at a fairly high competitive level and can now barely see the ball, even less move to intercept it! Some of the time we were left on our own to walk round the lake and enjoy the flowers. It was easier when Iain arrived with a car. One of our walks in the mountains was early in the morning and the kids were barely out of bed when we returned at noon. Iain continued that particular day spraining an ankle at basketball and falling off a mountain bike almost dislocating his thumb. We started to doubt our transport for the first leg of our journey home! The area near to our apartment was still something of a building site – albeit very smart and somewhat up-market! Huge volumes of rock had been moved and massive equipment continued to be used excavating new foundations. The vegetation in the rubble of the new man-made landscape in similar circumstances would be untidy weeds at home. Here too, although interspersed with a few alpen flowers it was substantially first-colonized with weeds such as hogweed, dock and willow herb. But what weeds – the blazing white huge handsome stately hogweeds were quite stunning as were other umbellifers, many in numerous shades of pink; huge luxuriant docks, traditionally used there for cooking, looked ready for harvesting and it might be hard to imagine how beautiful willow herb can be! 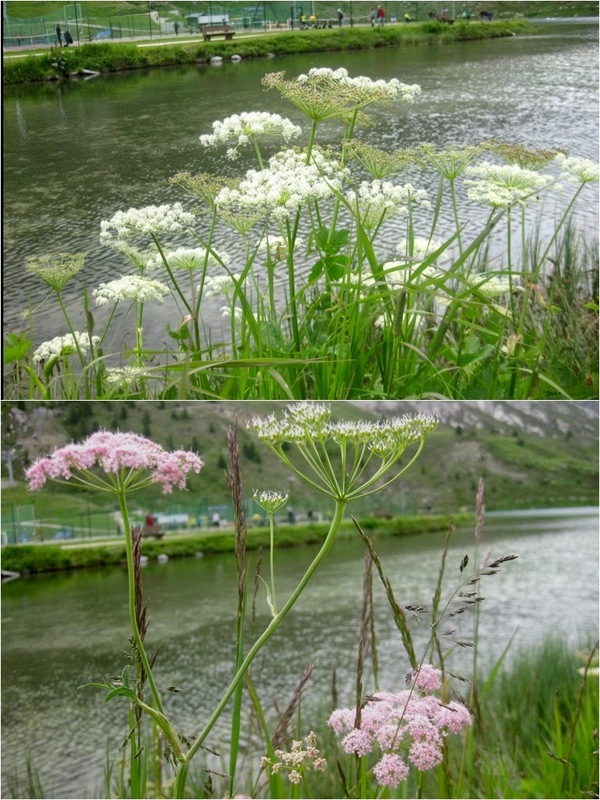 In contrast the more mature man-made landscapes as you walked through the towns, round the lake and up in the hills were habitats for exquisite and rare mountain plants. 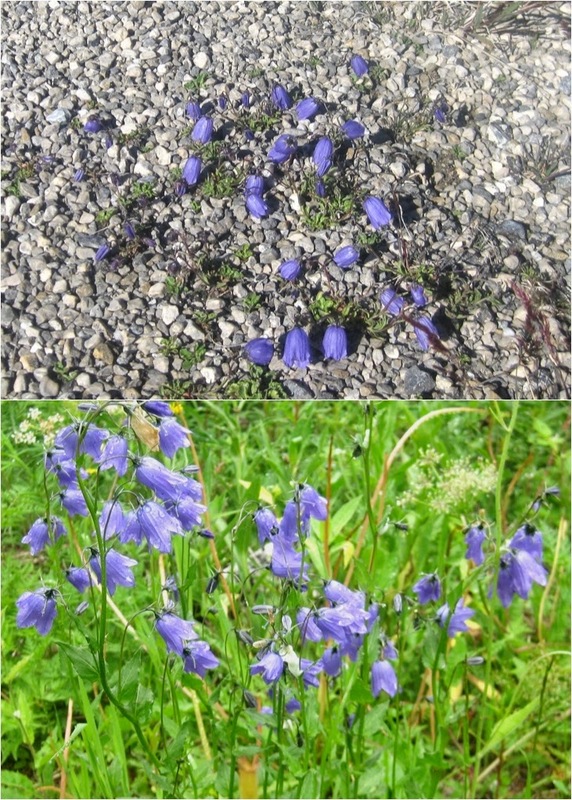 Not all the plants were alpines in the sense of the word used by gardeners when describing dwarf plants. Although shrubs such as wild roses and rhododendrons tended to be somewhat more compact, many of the herbaceous perennials were tall and luxuriant, especially at the lower altitude at 1500 meters. As you went higher - we got up to 2500 meters - and left the protection of the valleys, plants became smaller. Apart from a genetic disposition to be small, the effect of low nutrients and wind pruning, and as you go higher, the increased ultra violet light, keeps plants petite. We had an illustration of the healthy clean air and intense bright sunshine when Iain, straight from London offices, quickly turned pink! He had neglected his sun screen! Personally as I am outside all the year round I don’t use the stuff and prefer to enjoy sunshine’s health enhancing effects and of course vitamin D. Never-the-less if walking at such altitudes all day I might be persuaded to conform to fashionable mores. We departed Tignes 1800, the name the tourist board are failing to establish for the new lower part of the town next to the magnificent EDF dam, and added 700 meters of elevation in Iain’s hire car. We arrived for our walk at 8am in the still chilly mountain air. It was a beautiful sunny morning. Here high in the mountains the plants were truly alpine. A friend of Iain’s had previously expressed surprise the there were reedy peat bogs at such high elevations! There are hundreds of varying niches up there in the mountains and although many plants are ubiquitous, others only thrive in specific locations. Sites not only vary in altitude, there are differences in aspect, exposure, pH, moisture and soil. Some plants grow in pure rock! The melting snow from higher elevations, numerous springs and early Summer rain creates many unique environments. Some plants in well drained scree receive a constant flow of well oxygenated water with very varying nutrients and pH. Later in the season for some plants drought will prevail. What glorious diversity. At home we associate the encrusted saxifrage with well drained scree. Here on a water splashed rock a moving film of oxygenated water provides a natural hydroponic system! The only irrigation for this sempervivum is rain. We were informed on return to our apartment that collecting wild flowers is illegal!